As soon as I got this box, I cancelled this subscription. It felt really weird to do so, but it’s just not meeting my expectations. I’ll address why in this post, as well as a few suggestions if anyone out there wants ’em. The quality of the handmade jewelry is okay. Some of the fittings are nice, but some are low quality. The Dollar Tree makeup is of a disappointing quality, and I don’t feel like it adds anything to the box. The other goods feel a little random, and I just feel like I can’t personally see my expected level of value in the box. I still think it could easily be a good fit for others, but it’s not right for me. Too bad. 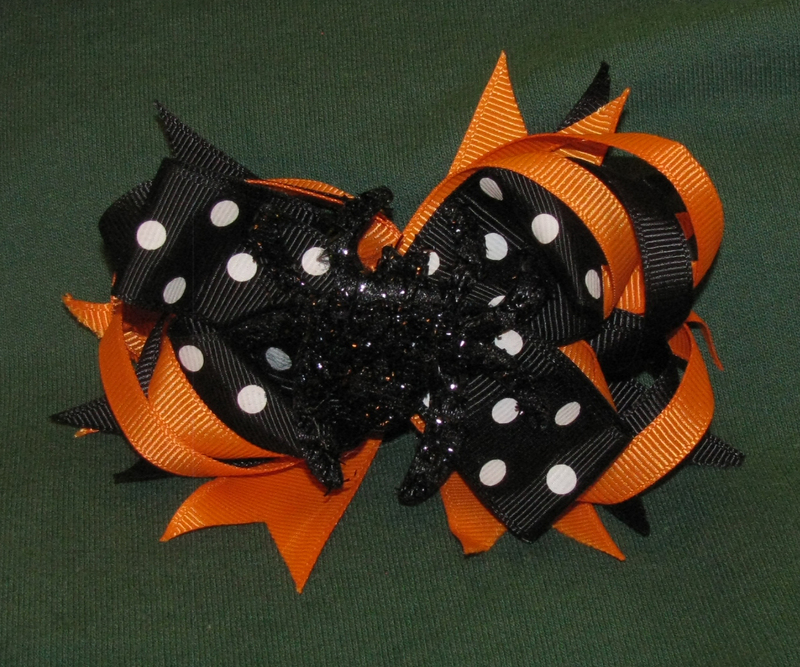 Halloween orange and black spider hairbow – This was significantly smaller than the last bow (hallelujah) but it ALSO features orange grosgrain ribbon and a spider. UM. This one includes some black ribbon and the spider is a sparkly thing, but against the black and white polkadotted ribbon, it gets a little lost. It’s fine, but again, a bit childish. I’ll turn this into a Halloween decoration, just like the last one. Green Kleancolor “metallic” eyeliner – I think this is the same brand as the dried-out liner I got last time. This was a pearly (NOT metallic) liner and poorly pigmented gloop that came out clumpy. No thanks. she Makeup nail lacquer in black – Same brand as the last bottle I got. Fortunately.the pigmentation in this polish is better, but it’s still a $1 polish. I tried it out–admittedly, over another polish–and it never cured. I’ll try it on bare nails, but if it’s performs just as poorly next time, I’ll just be chucking this in the trash. Boo. 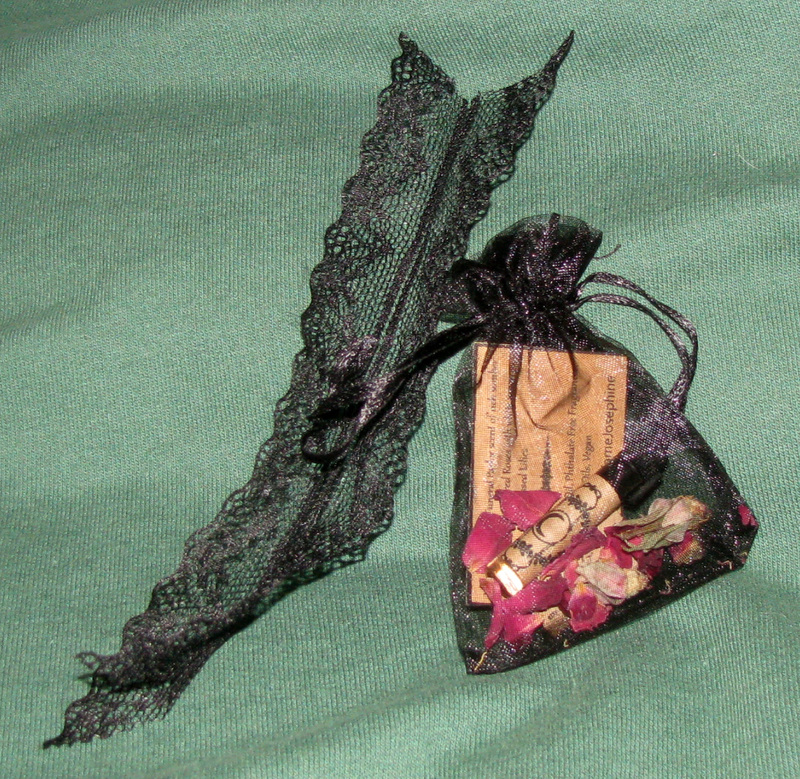 House of Madame Josephine perfume in Mourning Veil (sample size) – This came in a black bag, tied with black lace and filled with a dried, torn up rose. Cute presentation! The scent, however, is NOT for me. they describe it as “a funeral parlor scent of rich somber carnation, dried dark red roses with white moon kissed lilies”. Very gothy, but definitely a funeral smell. I feel like it needs another note, like dirt, to make it more rounded and complex. Still, this was a nice toss-in, but I’d value this no more than $2. 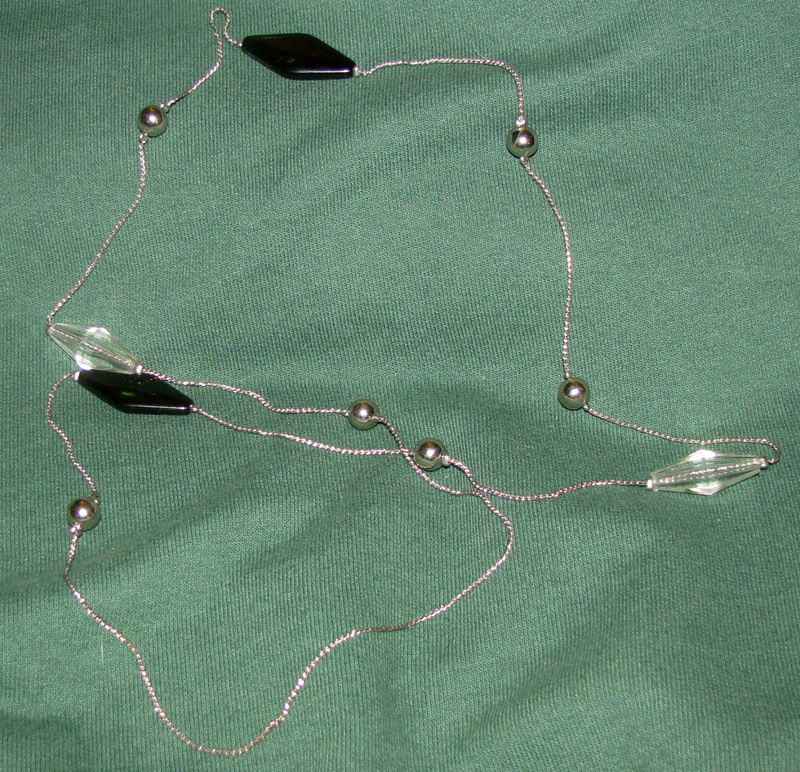 Beaded silvertone necklace – I can’t tell if this was handmade, which is disappointing. It’s a fine necklace, but the plastic beads are scuffed and the metal beads are a bit oxidized. I will wear this, but it’s definitely extremely goth-lite–which, to be fair, is how I described myself in my customization profile–but not particularly special to me. I feel like I could pick up this necklace anywhere. And for less than $5. Purple and brass bohemian bracelet – This is really lovely. The focal piece is a reasonably nice quality piece. The strap is a mixed material braid with fabric and a bronzy cord. In my customization profile, I mentioned that I would only want bracelets if they were fairly long to accommodate my big wrists, and she definitely came through on that front. The expander could make this up to like 8 or 9 inches. I really appreciate that and commend the craftsmanship here. It almost sounds like she’s trying to span both adults and pre-teens. Or maybe teens and pre-teens? 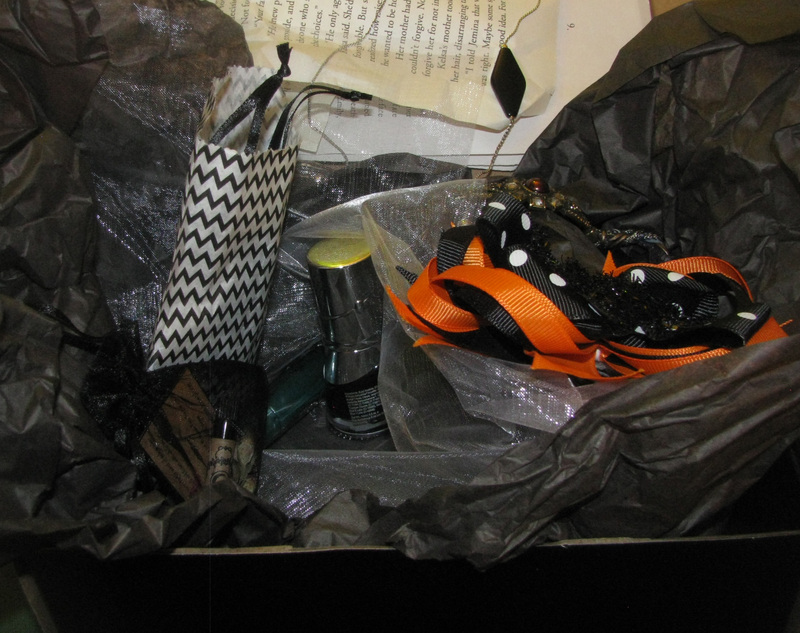 I see a goth teenager and her younger sister being excited about this box.